Union members earn 34% more than non-union workers. More than 75% of union workers have health benefits. Less than half of non-workers have health coverage. Nearly 70% of union workers have a pension. Only 14% of non-union workers have one. The 10 states where unions are strongest have higher earnings, better health coverage, less crime, more civic participation, less poverty and better schools than the 10 states where union membership is lowest. 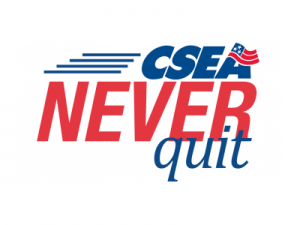 Responses to three reasons non-members won’t join CSEA! REASON 1: I don’t believe in unions. RESPONSE: Do you believe in being fired without cause? Do you believe in child labor? Poverty wages? No retirement system? Straight pay for overtime? 48 hour workweeks? Unions are the only means for workers to deal with management on an equal basis. Unions and union members have established and protected workplace and civil rights for almost a century. How can you believe in America and not believe in unions? REASON 2: Who needs the union? What has it ever done for me? RESPONSE: Most of the things that make your job worth having exist only because the union exists. If the union ceased to function tomorrow, how long do you think you’d have the salary and benefits you have now? REASON 3: I can’t afford the dues. RESPONSE: You don’t really believe management gives raises out of the goodness of their hearts do you? Management wanted to freeze your wages, cut health care benefits and increase hours. You’ve got it backwards. Given what management wants to do to our pay and working conditions, we can’t afford to pay union dues. Sometimes union members ask some pretty tough questions. Following are suggested answers to the kinds of questions we all hear. Q. Why do unions always seem to protect lousy employees? I’m tired of my dues going to pay for representation of the workers who is constantly messing up. A. When you join a union and work with a contract your job becomes your property and you can not lose your job without due process and representation. That is a right worth protecting. Q. I pay agency shop fee instead of dues. Why should I make the switch to membership, I get everything anyway? A. Because you get a lot more than you might know about. As a member you are entitled to vote on your contract and your leadership – you have a voice in running the union. In addition, there are a ton of benefits and information that are for union members only. Q. I keep reading that labor unions are shrinking. What is going on and why? A. The number of union members as a percentage of all workers has been in a slump for 20 years. However, the total number of union members has remained fairly constant. It is the number of jobs and the type of work that has changed. Changing this problem has been and will continue to be a chief focus of the labor movement.